Space themed Birthday party? You can do it! If you hear these words, don’t panic. Repeat: don’t panic! You have a little astronaut or astronomer in your family, so consider yourself lucky. And as for the space themed party, you can totally do this! When planning “out of this world” space games for your party, choose those with simple rules and familiar layout, especially if the guests are quite young. Traditional party games will turn totally spacey with just a sprinkle of stardust! Older children will enjoy playing these games too. It’s not a treasure hunt anymore, it’s a planet hunt. Objectives: to find all 8 planets and (for the Y1 kids and older) to arrange them in the right order. How to play: Divide the kids into two teams, each with a task to find all the Solar System planets hidden around your house. The planets have to be returned to “the base” and arranged in the correct order, i.e. Mercury-Venus-Earth-Mars-Jupiter-Saturn-Uranus-Neptune. You can prepare two big sheets of paper with the Sun and orbits of the planets drawn on and ask the kids to tape the planets to their orbits. The first team to complete the task wins! Don’t forget to take a picture of each team with their “Solar System”. Forget the tail. There are so many space objects waiting to be pinned in the right place! The Sun belongs in the center of the Solar System. The Earth is the third planet from the Sun. A huge black hole sits in the center of our Galaxy…The options are endless. Let the Birthday child choose! If your guests are quite young play the musical planets the same way as musical chairs. Use pictures of the planets taped to the floor, instead of chairs. Older children can follow more complicated rules with actions depending on the properties of each individual planet they are about to “land on”. For example, Venus is to hot to land (i.e. sit) on, so one can crouch instead! Whoever doesn’t get a planet to land on or lands the wrong way is out! It will be fun to decide on the rules together with the B-Day child. You both will definitely learn a thing or two about the Solar System along the way! A version of an obstacle course, this game is better played outdoors. Introduction: Europa is one of Saturn’s moons. It has a huge ocean of liquid water underneath the icy surface. Scientists would love to sample Europa’s waters! Who knows, maybe there is some alien fish swimming in its ocean. To get to the outer Solar System where Europa resides, the astronauts will have to fly through the asteroid belt. There are millions of space rocks orbiting in the belt. It would be a terrible accident to bump into one of them. Objectives: to arrive to Europa safely avoiding the asteroids, collect as much water as possible and return back home to the Earth. A bucket of water will represent Europa and the objects scattered about will be asteroids. How to play: Create an obstacle course by scattering objects on the floor/ grass and hanging them from the ceiling/ branches. Divide your guests into two teams. Two people, one from each team, get blindfolded and begin the course (provide each player with a mug for water collection). Other team members guide their players through the asteroid belt by shouting out the instructions. The blindfolded players find their buckets (“Europas”), fill their mugs and return to “the Earth” while trying not to spill any water on the way (it’s the same obstacle course on the way back). They empty the “samples” in their respective “sample collection” buckets. Then the next two players begin the game. When all the players have a turn they compare the samples. The team that collects more water wins! This is our absolutely favourite craft. It’s fun and easy to make and looks stunning when finished! Little kids, teens and adults will enjoy creating their own galaxy. And the best bit? No two will look the same. 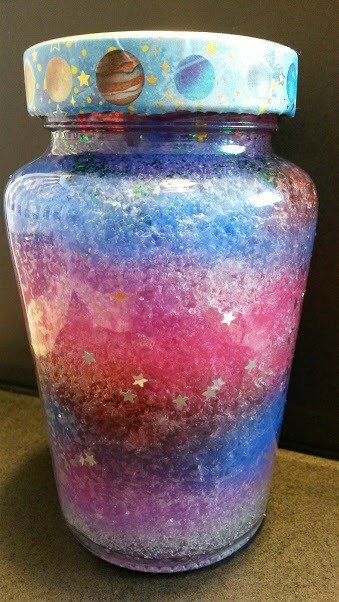 To make your own nebula put a layer of stuffing in a jar, pour over some coloured water and sprinkle with glitter. Repeat the process until the jar is full! 1 cup flour, ½ cup salt, 1 tablespoon cream of tartar, 1 tablespoon oil, 1 cup boiling water. 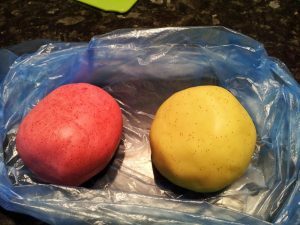 You can use food colouring, sparkles, for decoration and essential oils and spices to make it smell nice. Be creative! Green for “alien slime”, white with glitter and foil stars for “the Milky Way slime” and blue/pink/ black with sparkles for the “Space slime”…you can never go wrong with slimey activity. 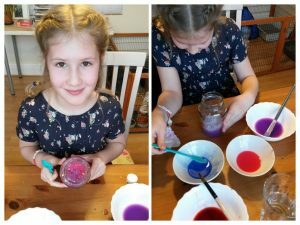 Here is the slime recipe that worked for us! Bracelet, necklace or keyring – it’s up to you. 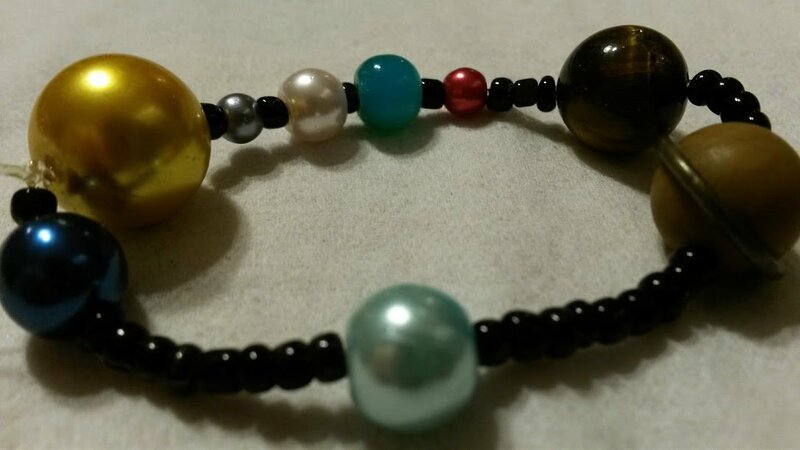 You will need a string/ rope/ elastic and a variety of beads in “planet” colours and relative sizes i.e. big yellow for the Sun, small grey for Mercury, orange for Venus, blue and green for the Earth, red for Mars, big orange for Jupiter, yellowish-brown for Saturn, different shades of blue for Uranus and Neptune. If you want to spread them out, add some neutral colour round or star shaped beads. Make sure the bead holes are big enough for the string of your choice. If you have a stack of cardboard boxes in the basement, bring them in. They are about to turn into a sophisticated spaceship. PVA, paint, foil and coloured paper will help the rocket engineers decorate their creation. Beware: things can get messy! Older kids can make a flat rocket and turn into a photo booth. 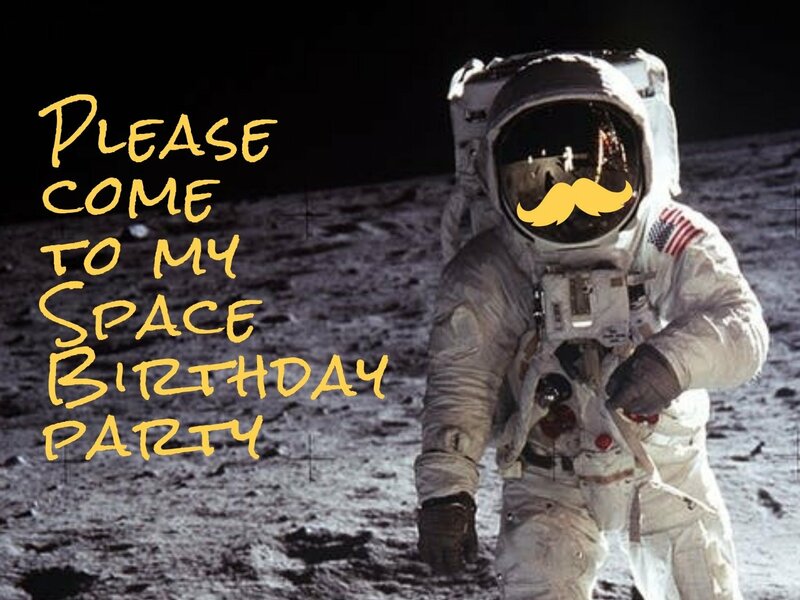 If you have an instant camera or a photo printer, send those photos out as space party favours. Did you know that you can book our inflatable space dome for a Birthday party? Oh yes, you can! If you are thinking about surprising your child and his/her guests with a personalized planetarium show, please bear in mind that you will need an indoor space big enough to accommodate one of our domes. Local church halls and sports venues usually work a treat. To tell the truth, our hearts bleed every time we see those little plastic bags filled with plastic party favours. 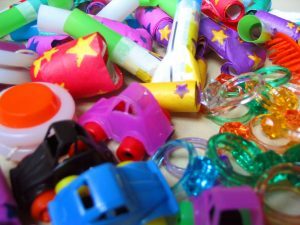 So if you still want to provide party bags for the guests, aim for environmentally friendly, reusable and long-lasting. Pack the childrens creations (playdough, slime etc) in glass jars, tin boxes or paper bags to take home. You can pre-print some lovely labels in advance. Glow in the dark stars, though made of plastic, are absolutely magic. They are fairly inexpensive too. You can make your own glow in the dark stars by painting a piece of stiff card with glow in the dark paint and cutting out the shapes with a star/Moon shaped cookie cutter. The stars will go well with a print-out sky map like this one (make sure you have the one for the right month!) and will hopefully inspire some stargazing later. Alternatively, send your young stargazers off with a DIY planisphere kit. Here are the instructions and templates for the diy planisphere by Jodrell Bank. Looks like you are all set for games and crafts! You can finally sit back and enjoy looking through the pictures of those amazing space cakes on Pinterest!